The DNSODM204_QUADMIC is a SODIMM module that can be installed in a 204-pin DDR3 SODIMM socket. This module contains four Mictor connectors. Logic analyzers from Tektronix and Agilent can be directly connected to FPGA pins enabling direct high-speed debug of FPGA signals. 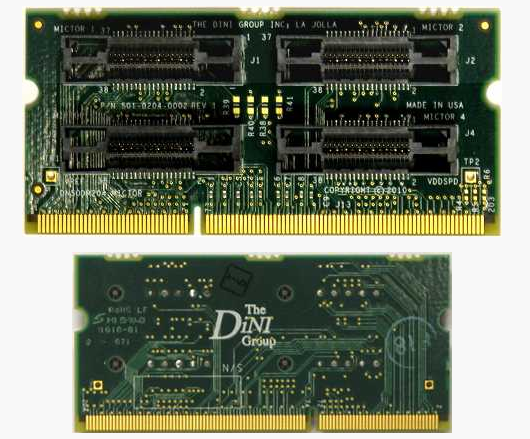 The DNSODM204_QUADMIC is compatible with the DDR3 SODIMM sockets onthe DNBC3_SODM204,DINAR1_SODM204,DN2076k10, DNV6_F2PCIe, DNV6F6PCIe, and DN-DualV6-PCIe-4.